My, how time flies! I feel like I barely have any time left for blogging or looking at clouds. I may have got a lot on at the moment, but I still remember you, my lovely blog readers! My calendar may be bursting at the seams, but I still plug social events into my calendar and stick to them. On 21 April, Ralph and I attended an event for two highly anticipated Premier League matches: Tottenham Hotspur vs. Manchester City and Liverpool vs. Chelsea. 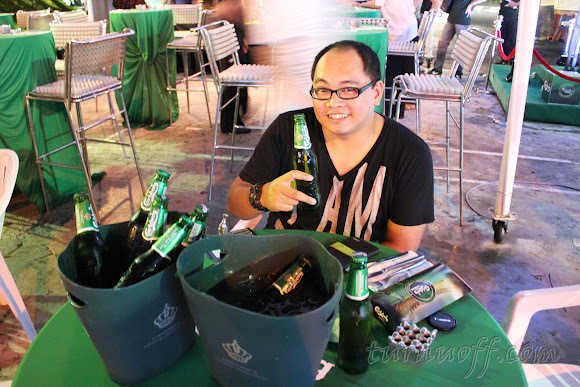 Despite not being an avid fan of football, I was rather excited by the football frenzy at the Carlsberg viewing party. #7 Thanks to Time Out KL for the buffet dinner + 2 buckets of Carlsberg pint bottles! It was indeed a real treat for football and Carlsberg fans alike. Besides the food, beer, great company and loads of freebies, there was also football quizzes held throughout the night and a ‘Guess the Score and Win Contest’. Best of all, fans of the English Premier League had an exclusive opportunity to get up close with football legends in person! #10 Ralph took a few pictures with them, got their autographs and he couldn't be happier, hahaha. Well, if I saw David Beckham, I think I would probably faint onto his shoes and miss the autograph session completely!